UK Scientists Are Launching a Satellite Powered By... a Google Nexus One? 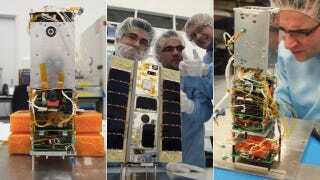 A team of scientists from the University of Surrey, UK, are excitedly putting the finishing touches to their latest satellite, called STRaND-1. Due to launch on February 25th, the hi-tech beast is powered by... a Google Nexus One? "A smartphone on a satellite like this has never been launched before but our tests have been pretty thorough, subjecting the phone to oven and freezer temperatures, to a vacuum and blasting it with radiation. It has a good chance of working as it should, but you can never make true design evolutions or foster innovation without taking a few risks: STRaND is cool because it allows us to do just that."